Pier 4 condos are meticulously designed and ideally located, giving you the best in luxury living right on the waterfront. As a resident of Pier 4, you have direct access to the Financial District, Downtown Boston and Beacon Hill, as well as water access to Charlestown, East Boston and Logan Airport. This thriving neighborhood highlights the natural beauty of Boston's skyline, green landscape and pristine waterfront. These boutique residences feature hand-selected designer finishes on everything from gorgeous hardwood flooring to spacious floor-to-ceiling windows giving way to crystal clear views. What once began as a thriving shipping port has now evolved into a luxury living paradise for young professionals, families, singles and couples. Tired of commuting into the city? You're a quick walk or T ride away from the Financial District. You're also close to the North End for spectacular dining and pastries, as well as Faneuil Hall for eclectic shopping experiences. Of course, who can forget Fenway Park for Red Sox games, or TD Garden for Bruins and Celtics games? 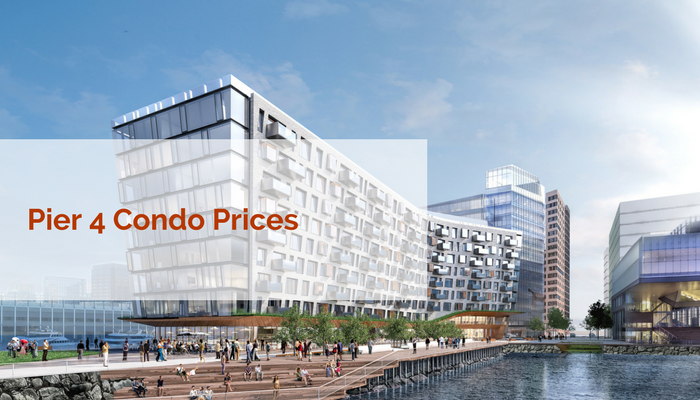 The prices for Pier 4 put you in touch with the lifestyle you've always wanted. Isn't it time to take a look? We would be happy to help. Pricing for individual units can be discussed in one-on-one appointments when you meet with us. Come view a unit or two depending on your needs and budget and we would be happy to talk price. Just call Elevated Realty at 617-701-6300 or email us at info@elevatedboston.com.